ABA ( Applied Behavior Analysis / Applied Behavioral Analysis ) is a science that has emerged in psychology , but it is used exclusively for procedures that are objective and scientifically proven , and derived from the principles of human behavior . These scientifically proven procedures are systematically applied to cause changes and improvements in the social behavior of a suitable man / child ( language development , play , social behavior , progress in subject teaching , the adoption of general knowledge , the expansion of interest , etc. ) . Science tends to prove that it was certain procedures which were applied during the work with children ( or experiment ) , that were the reason for the change or improvement in behavior ( Cooper , Heward , & Heron , 1987, 2007) . Behavioral analysis is the science that deals with the only objective observation and measurement of every human behavior and the effect of that behavior and environment ( reciprocal relationship between the behavior and the environment ) . Then , only with objective and systematic manipulation and changes in the environment we can influence the changes in child behavior (learning , speech , relationships, interests, independence , sleep , obedience , level of frustration , etc. ) . While using this teaching method we still use the measurement , and the results of the work are always quantified and objectively analyzed, so there can be made scientifically valid decisions about changing the methodology of work , quality of work , acquisition of knowledge and the effectiveness of the methodology chosen at this way of learning . Because of constant measurement of the quality of work and adapting the child’s success in education and working with children with and without developmental difficulties is much higher than that of subjective and eclectic approach to teaching and therapeutic work..
What is EDUS? 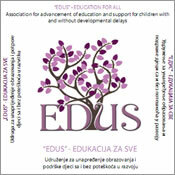 EDUS is a non-governmental organization , in cooperation with public kindergartens and schools provides enhanced scientifically proven model of education for children with and without developmental disorders , education and the advancement of knowledge of professionals , training and support for parents through lectures , scientific cooperation and the wider professional community . WHEN AND HOW WAS EDUS ESTABLISHED ? In November 2010, bringing together experts, parents and citizens , EDUS has emerged as an expression of the need to create a unique alliance of individuals and groups , who in front of them have a vision of realizing the full potential of every child , whether with disabilities or not . As a result , this made an alliance involving all stakeholders , regardless of whether the government or not parents , experts , representatives of the authorities and other citizens that their natural , professional or official position, participating or with a wish to participate , in a joint effort to improve existing systems to support the development and education of children , regardless of their ability . EDUS officially registered on December 12th 2010. The main drivers of the Association are professionals and parents gathered around the ” Mjedenica 2010-2011 ” who wanted an excellent practic , manifested in a constant and measured the progress of children involved in the project , retained and incorporated into the system . In doing so, we seek to constructively use the human creative energy and technical coordinator of the project , a scholar in the field of pedagogy , psychology and special education Ph.D. Nirvana Pištoljević , who wants to use her knowledge and experience gained in the United States to help the children in Bosnia and Herzegovina. 3. Raising awareness – Raising public awareness about the need for a comprehensive approach to support the education of children with the aim of satisfying their individual needs , as well as raising awareness of the general public about developmental disorders and existing support systems . Teaching programmes, teaching materials are determined by individual levels of functioning of each student . Constant data collection result in clear indicators such as the rate at which a child adopts new social and academic skills, quality of the instruction and of the individual work plan , etc. on the basis of which decisions are made about the future following sequence of work . Direct observation / monitoring take place in natural and simulated environments / circumstances . Material or skills that the child independently and spontaneously knows how to use all these new situations is considered to be overcome and that means it’s time for the next goal , ie to upgrade and expose the child to new skills . Educators ( teachers , special education teachers , speech therapists , teachers , psychologists) must use scientifically proven tactics , educational interventions , the principles and methods of work with children to effect the work of each student and provide advancement of each student according to his / her cognitive development opportunities . (For example, students who have not developed vocal communication in a natural way , by using scientifically proven methods need to learn alternative communication skills) . A parent education is a must and very neccesary through lectures , practical exercises and individual meetings, in which we inform in detail about the development of their child and indicate how to apply the method at home . Working in the classroom is based on a positive approach , avoiding any form of punishment and negativity . WHICH ARE THE EARLY SIGNS OF DEVELOPMENTAL DISORDERS/DEVIATIONS? 2. Disturbance in verbal and nonverbal communication. 3. Stereotypical / automated ( recurring ) behavior , which are essentially autostimulative conduct which has the purpose of obtaining reinforcement ( pleasant stimulation ) through the five senses without the need for communication or contact with people , which in itself is atypical and inappropriate. These behaviors / actions, children are increasingly “close to their world ” and separated from the environment and society because it is through these kinds of incentives they do not stimulate language development , appropriate games , socializing , etc. Autism or ASD (Autism Spectrum Disorder) can be diagnosed in children aged 12 months. Lack of eye contact, absence of vocation, the development of the first words and chatter, and underdevelopment of purposeful play and imitation, when they are obscured by 12 months. Timed medical diagnosis, although necessary for the exercise of other rights, is not crucial to the basic work with the child and stimulation of the development of skills that the child has not developed. The key is in the intervention and the opportunities and plasticity of the brain at an early age to compensate and develop skills through work and stimulation although naturally they are not developed. The smaller the gap in development, more and faster work can be compensated. Therefore, the diagnosis after a few years of intensive interventions can completely change or be gone. It has been shown that intensive educational treatments in young age (2-4 years) cause long-term positive effects on the overall future development of the child. The most important factors related to a better prognosis for children with ASD and all developmental disorders are early identification and appropriate early intervention. It has been shown that intensive educational treatments in young age (2-4 years) cause long-term positive effects on the overall future development of the child. Intervention in the early developmental stages has the greatest chance of impairment in short-term and long-term consequences of developmental difficulties and disorders in the life of the child and family. The earlier you identify developmental delays, early intervention will start, even if you do not have an established diagnosis, and get better results, reducing developmental delay risk with children compared to typical peers and enhancing their participation in the society! WHICH DEVELOPMENTAL DISORDERS IN THE EARLY AGE HAVE SIMILAR SYMPTOMS AS AUTISM? - Learning disabilities – A child does not adopt the material at the same rate as peers , begins to close in itself , avoids working with other children , and communication as being ashamed or does not understand what it is and is asked of him / her , becoming aggressive or auto-aggressive . - Hearing – A child is not developing speech or communication , then there is no socialization because it does not hear well , and he/she can not understand or pretend to speak of others. The child also can not respond to it’s name and understand the vocal demands around. - Speech and language disorders – A child does not develop verbal communication or socialization , because it cannot follow it’s peers , and every aspect of learning is slowed . - ADHD disorder and attention deficit hyperactivity disorder – Children have very selective attention , so it seems that they do not understand what they are told , or do not respond to vocal commands , are very impulsive and unable to maintain attention long enough during instruction or an activity and often it seems have a delay in development . - Reduced cognitive abilities ( mental retardation ) – A child develops a large delay in all developmental areas , a delayed development of speech , understanding of events and the environment , and is developing and autostimulative behavior stereotypes . - Fragile X Syndrome – This is the most common inherited genetic disorder reduced cognitive (mental retardation ) and developmental disorders . Children have problems with learning and with appropriate behavior , with the development of speech and socialization . - Rett ‘s syndrome – child develops stereotypical behavior , has undeveloped speech , lacking socialization , it is very visual and ongoing regression and loss of fine , then loss of big motorskills that does not exist in ASD disorders . - Nursery disintegrative disorder or Heller’s syndrome – Children have the typical development to 3 years , and then coming to a drastic regression and loss of cognitive and communication skills , as well as appearing stereotypical behavior . Loss of every receptive , expressive and gesticulative communication . - Landau – Kleffner syndrome – very similar to Heller’s syndrome , where the child starts with typical language development , followed by a loss of expressive and receptive communication functions ( understanding and use of speech ) and to the development of epileptic seizures . Occurs usually between 3 and 7 years of age , and 75 % of children develop irreversible receptive / expressive language disorder . - Reactive Attachment Disorder – The result is severe psychosocial deprivation and has strong similarities with autism because children have appreciable delay speech development , atypical social communication and stereotypical behaviors . After adequate interventions and socio – speech stimulation , children can develop appropriate behavior . HOW TO SCHEDULE AN OBSERVATION/CONSULTATION WITH THE EXPERT EDUS TEAM?? EDUS consultation with staff consist of a general evaluation of the child’s level of functioning, functional skills tests, and an interview with parents. This two-hour sessions educators creates a clearer picture of the current number of skills that a child has, the repertoire and skills that are not developed. The aim of the initial observations is to create the plan and program of long-term goals that need to be converted to an individual plan and program of work with a child. You can contact the at : edus.bih @ gmail.com or on any of our telephone numbers / listed below. .
WHAT IS THE DIFFERENCE BETWEEN THE MEDICAL DIAGNOSIS AND EDUCATIVE CATEGORY? Early medical diagnosis is very important, but it is more important to a child’s development to begin intervention as soon as you notice discrepancies, unrelated to medical diagnostics. Also, medical diagnosis demands a lengthy process during which the child loses valuable time for early intervention, and it is recommended early stimulation and work as soon as they notice any developmental deviations (large and fine motor skills, socialization and delay of speech, cognitive and emotional bias). Medical diagnosis is talking about the health status and health needs, but does not talk about the educational and developmental needs of the child, does not specify what types of support and stimulations are needed for that child to improve his / her current state.